Another one bites the dust! 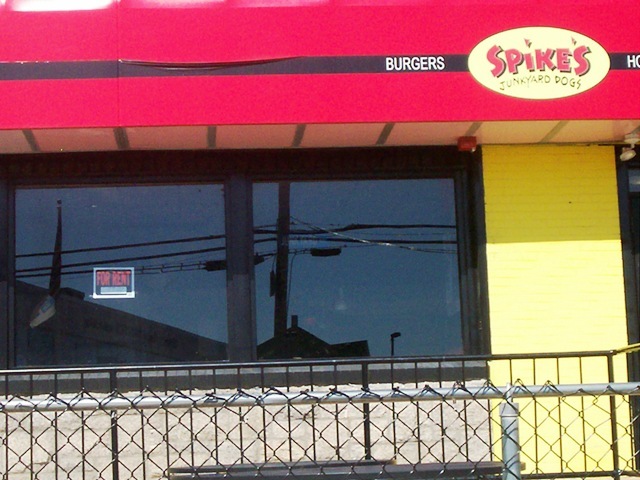 Maybe Caliente will buy the Spike's building outright? Here's hoping! A few years ago CHEF DAVE MARKS ran the CALIENTE RESTAURANT in the ALMAC'S DINER PLAZA ( Executive Plaza ) at the bottom of President Ave. in Fall River . It was a HUGE success . 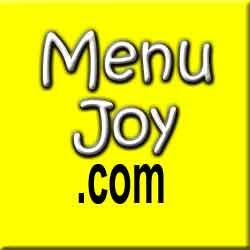 The place was always full on Friday and Saturday nights and they had an excellent rating on local foodie sites . So , Laura and I , always a day late and 3 eggs short of a dozen , finally decided to try them . When we got there we were met by a darkened restaurant and a large sign in the window . It said that due to new businesses NOT being supported properly ( forgive me ...I'm trying my best to recall ) they were forced to close and were hoping to open up somewhere more appreciative . They thanked their loyal customers . WOW ! Cut to a couple of weeks ago ......The Herald News had an article about the former chef at CALIENTE ( now a hit in Boston ) hooking up with his friends who owned SPIKE'S JUNKYARD DOGS . They were going to take the " fast foods " of the old CALIENTE menu ......you know ...things like tacos , burritos etc. and start offering them from the SPIKE'S eatery . AND THEY DELIVERED !!!!!!! Always a plus in my book . So because Laura had a bad day and because my foot was still hurting and packed in ice .....and because I didn't feel like making supper ( mostly the latter ) , we decided to place an order to be delivered . We called around 6:00pm. and it arrived HOT and wonderfully packaged at 6:40pm. 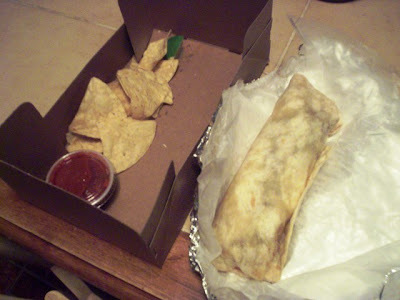 Each meal was in it's own cardboard box and contained the entree ( wrapped tightly in foil ) , with mine ...a cup of fillings on the side , and all had some tortilla chips and salsa included ( wish I had know this because I ordered chips & salsa separately ) . Oh well . 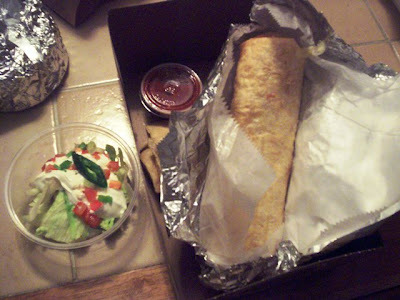 I had ( and I've been dying to try one ) a chimichanga ....a chicken chimichanga to be exact . ( I'm going to say chimichanga a lot .....I like it ) It's a burrito wrap , large and filled to the point of being hefty , with delicious seasoned ,shredded chicken and cheese . Then it's deep-fried till lightly crunchy . My accoutrements ( fancy , huh ? ) 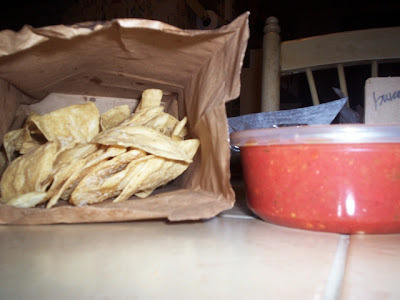 came on the side as well as the afore mentioned chips and salsa. 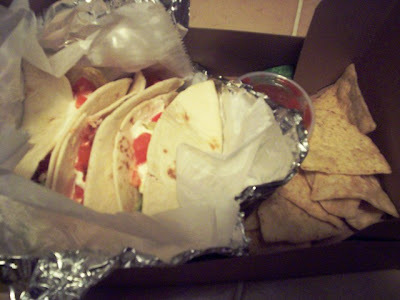 Laura had the tacos 3-pack . She chose 3-soft tacos ( you can get 3-crunchy ) filled with chicken and of course ....cheese , lettuce ,tomato ,salsa and sour cream . Hubby got the beef burrito . It was large and stuffed with spicy beef and all the fillings . Believe me ...one of these makes a meal . 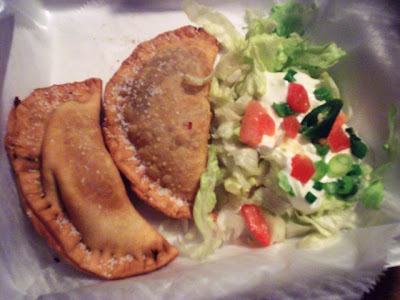 But since we wanted to try a lot of different things ....and because we're piggies ...we also got a couple of empanadas . These are a Spanish turnover filled with shredded pork , cheese and onions , deep-fried golden brown and served with sour cream and scallion . VERDICT ........All three of us agreed ......this was the BEST Mexican food we've had thus far . 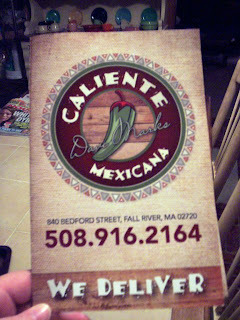 You know Laura & I love SAM DIAGO'S ( on the Cape ) ...we also love FIESTA ( in Somerset ) and TORTILLA FLATS ( in Providence ) ( we'll skip Taco Bell ) but this was the tastiest , freshest , most authentic Mexican we've had the pleasure of eating . I can't wait to order again . That's it !!!!!! That's their entire take-out menu . You don't need a lot of choices with food this good . We ordered one of everything except the tostada ......we'll get that next time . With tip for driver .....we gave $ 25.00 .....not bad for SO much food ........OLE !!!!!!!!! !